8x10 Tabula Mundi or Rosetta signed print on matte photo paper printed with archival inks, matted in raven black mat board, backed with acid free foam core and ready to ready to frame in any standard frame. FRAME NOT INCLUDED. Ships flat, separately from other items ordered. 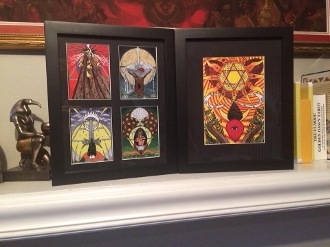 The option for four way window grid mat with four actual signed Aces or Princesses from the Babalon edition of Tabula Mundi only and is limited to one each per customer. Ships flat, separately from other items. Email for savings on shipping multiple prints together.